Suppose I have a clock and it reads 12 o’clock. If I set the clock forward one hour, then it will say 1 o’clock. If I do it again, the clock will say 2 o’clock, and if I keep setting it forward by one hour, after twelve times it will go back around to 12 o’clock. In the process of doing that, I have set the time to each hour exactly once. Now suppose that I do this again, but I set the clock two hours ahead each time. Starting at 12 o’clock, I’ll then set the time to 2 o’clock, then to 4 o’clock, then to 6, 8, 10, and finally back to 12 o’clock again after six settings. In the process, I didn’t set the time to every possible hour. No matter how many times I set the clock forward two hours at a time, I’ll never hit the odd hours: 1, 3, 5, 7, 9, and 11 o’clock. Similarly I could set the clock ahead three hours at a time. Now the time goes from 12 o’clock to 3, 6, 9, and back to 12 again. It took only four settings to get back to 12 o’clock, and I skipped a whole bunch of numbers. Similarly, if I take four-hour steps from 12 o’clock I go to 4, 8, and then back to 12, taking only three settings and again skipping lots of numbers. Let’s forget about five-hour steps for now. If I use six-hour steps, I just go from 12 o’clock to 6 and back to 12 again, so it takes only two settings to get back to 12. Let’s also forget about seven-hour steps for now. If I take eight-hour steps starting at 12 o’clock, I first set the clock forward to 8 o’clock. In the next eight-hour step I move right past 12 and end up at 4 o’clock. When I set the clock forward another eight hours from 4 o’clock, I’m back at 12 o’clock again. So using eight-hour steps from 12, the sequence was: 8, 4, and 12. If I use nine-hour steps, I go from 12 o’clock to 9 o’clock, 6, 3, and finally back to 12. Here we find that going forward nine hours is the same as going backward three hours. Ten-hour forward steps are similarly like going backward in two-hour steps, and eleven-hour steps are like going backward in one-hour steps, and there you have it. Note that each X-hour step larger than 6 hours is equivalent to going backward by (12 – X) hours. So: forward 8 = backward 4, forward 9 = backward 3, forward 10 = backward 2, and forward 11 = backward 1. But what do we have? And what about the five-hour and seven-hour steps that we omitted? What was the point of all this? If you imagine going forward by five hours at a time, starting from 12 o’clock, here are the hours that you’d hit: 5, 10, 3, 8, 1, 6, 11, 4, 9, 2, 7, 12. Notice that it took twelve steps to get back to 12 o’clock, and we hit each hour exactly once! Of course, a seven-hour step would have done the same thing in reverse from 12 o’clock: 7, 2, 9, 4, 11, 6, 1, 8, 3, 10, 5, 12. This is because going seven hours forward is equivalent to going five hours backward, so the sequence is simply reversed. Except for the five-hour steps, none of the other step sizes up to six hours could possibly hit all the hours in this way (except for the obvious case of one-hour steps) because it happens that their sizes all divide evenly into twelve. For example, six is half of twelve, so after two six-hour steps you’re already back at 12 o’clock. Similarly four is one third of twelve, three is one fourth, and two is one sixth. But five does not go evenly into twelve. Similarly, except for seven-hour steps, the step sizes greater than six hours (except for the obvious case of eleven-hour steps) when considered as their equivalent backward steps also divide evenly into twelve hours. Eight hours forward = four hours backward, and four is one third of twelve, and so on. There’s one more thing to observe here. In addition to seven hours forward being equivalent to five hours backward, five hours forward is equivalent to seven hours backward. So suppose that for some reason we didn’t want to have any of the settings make the hour go past 12 o’clock. Look again at our five-hour stepping sequence: 5, 10, 3, 8, 1, 6, 11, 4, 9, 2, 7, 12. The five-hour forward jumps that pass through 12, such as 10 to 3, could equally well be replaced by a seven-hour backward jump. So to get from one number to the next, we add 5, or, if the result would be greater than 12, we can instead subtract 7. To conform with musical orthodoxy (you’ll see later what this all has to do with music) we’ll consider the seven-hour sequence going from 12: 7, 2, 9, 4, 11, 6, 1, 8, 3, 10, 5, 12. This can be considered as seven-hour forward jumps combined with some five-hour backward jumps if you don’t care to pass through 12 o’clock. You could actually construct such a clock that tells time if you made your hour hand move faster than normal. 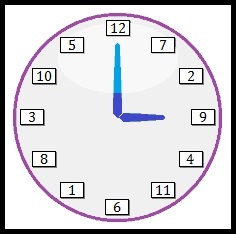 It just happens that 1 is the seventh number on this wacky clock, so the hour hand would move seven times as fast as normal, and it would be confusing to read most of the time. For example, the hour hand would pass over several other numbers to get from 12 to 1, so recognizing a time such as 12:15 would take some getting used to. But every hour the clock would be easy to read: you could just look at what number the hour hand points to and that would be the time. In the picture it’s 9 o’clock. Truly this is a wacky clock. 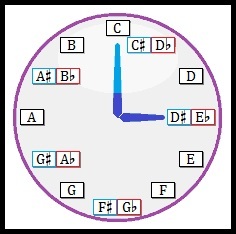 Each note within the octave clearly appears once on this clock face. 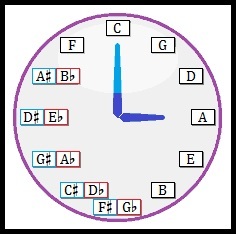 In the future we’ll discuss the circle of fifths in more detail. It’s a key element of music theory.